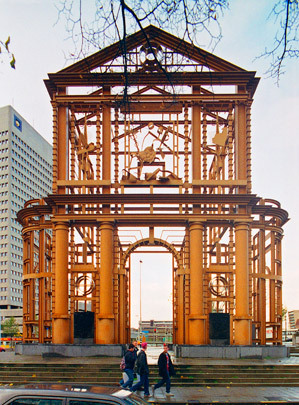 The original neoclassical gateway was built in 1772 to a design by Pieter de Zwart and immediately became one of the most familiar structures in Rotterdam. In 1939 traffic considerations led to its being dismantled brick by brick and moved from its site on Hofplein into temporary storage. Here, it was severely damaged in the 1940. To celebrate 50 years of reconstruction a new Delftse Poort, including parts of the original, now stands near the original site. The graphic, three-dimensional play of lines and the red lead completely covering it only serve to reinforce its air of incompleteness - and that of the city as a whole.